Download your field trip forms and learn more about our partner museums! Learn more about our curricula and find the program suitable for your classroom. Professor Leo is in his lab and ready to teach your students! Take a trip to a drilling rig! Join Professor Leo on location with this exciting virtual field trip. Need free science and math resources for your classroom? 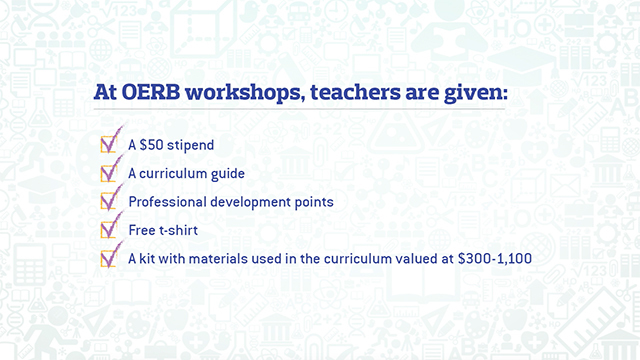 Sign up for an OERB workshop! Have you recently changed schools? It might be time to update your contact information. Click here to send us your current information! Bringing new energy into the classroom. Download the latest lessons by clicking on the pdf in your CURRICULUM RESOURCES section. Explore our E-Books! Click here to read digital copies of our Petro Pete's Adventure Series. Possum Belly: metal box built underneath a truck bed to hold pipeline repair tools-shovels, bars, tongs, chains, and wrenches. Farmer's Oil: An expression meaning the landowner's share of the oil from a well drilled on his property; royalty is traditionally one-eighth of the produced oil free of any expense to the landowner. Mousehole: A hole drilled to the side of the well bore to hold the next joint of drill pipe to be used. As volunteers, Petro Pros use rocks, fossils, drill bits and maps to demonstrate how oil and natural gas are formed, discovered and produced. Click here to request a Petro Pro for your classroom!